Chief Coordinator of the Caribbean Farmers Network (CaFAN) Jethro Greene. [www.inewsguyana.com] – Chief Coordinator of the Caribbean Farmers Network (CaFAN) Jethro Greene says farmers need to take their rightful place atop the power structure. 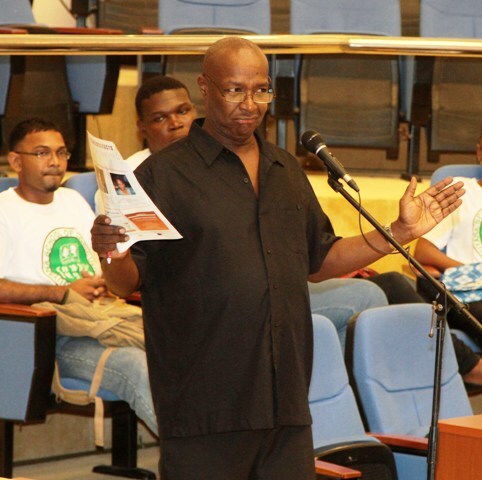 “Food and water are essential to life, whoever controls food and water actually controls power,” he told participants at a Youth Consultation on Community Agricultural Policy at the Caribbean Week of Agriculture (CWA). Greene says farmers should never underestimate the power of agriculture even though it has been relegated to the lowest rung on the social ladder. According to Greene, there was a conspiracy a long time ago by a cartel of companies to control and manipulate the food market so that farmers, particularly those in the Third World, were relegated to the lowest levels because they never controlled the marketing and distribution of food. The biggest money was in food, Greene declared. He added that farmers must regain the power by getting control of more of the value chain. “It is your job to think outside the box, not to accept the nonsense that’s been put on us about how agriculture is and how agriculture should be,” he urged the youths, most of whom were from the Guyana School of Agriculture (GSA). Greene called on the youths to come up with ideas that outlined the things they needed to spur youth interest in agriculture.